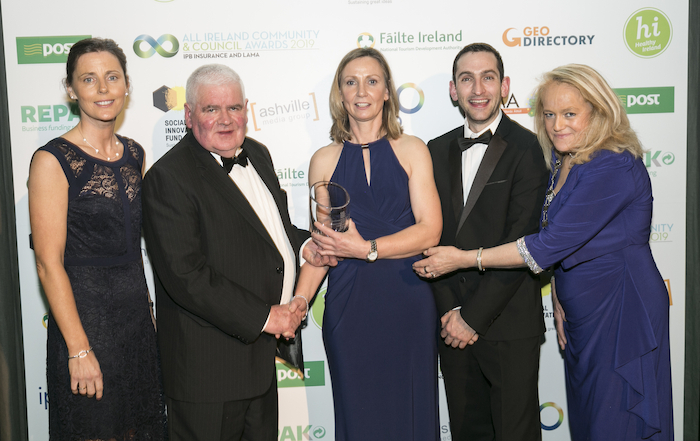 Westport Leisure Park Running Club, National Winners Best Community Sports Club/Team Category. From left Yvonne Byrne, (Westport Leisure Park), Cllr PJ Reilly (Longford), LAMA Executive Board Member, Colette Sweeney (Westport Leisure Park), Paul Feeney (Westport Leisure Park) and Cllr Mags Murray (Fingal), Chairperson LAMA Executive Board. Two Mayo County Council projects picked up awards at the Local Authorities Members Association (LAMA ) Awards in Croke Park, Dublin, on Saturday night, February 9. Community Representatives and Mayo County Council joined together at the All-Ireland Community and Council Awards where Westport Leisure Park Running Club were crowned overall national winner in the Best Community Sports Club category and ‘The Tubber Hill Housing scheme and master plan, a piece of Urbanism – An alternative to nine bungalows’ took the Silver award in the Best Social Housing Initiative category. These national awards, presented by LAMA and IPB Insurance, highlight and celebrate community and councils working together in communities, bringing national recognition to novel and progressive projects and developments that may otherwise go unacknowledged. Speaking after the council collected two awards in Croke Park, Mayo County Council chief executive, Peter Hynes, said: "I would like to acknowledge all of the projects that were submitted for this competition and in particular the five projects that were named as finalists from Mayo. "Significant work takes place all around this county where Mayo County Council and communities come together to deliver on new and novel initiatives that benefit all who live in our county and it is great to see the county bring home two awards." Leas-Cathaoirleach of Mayo County Council, Cllr Michael Loftus, said: "A well-deserved congratulations to the two projects which took home national awards and to our other finalists who deserved their recognition on the night. It’s a fantastic achievement for Mayo projects to continue to do so well and bring success to the county on a national stage."